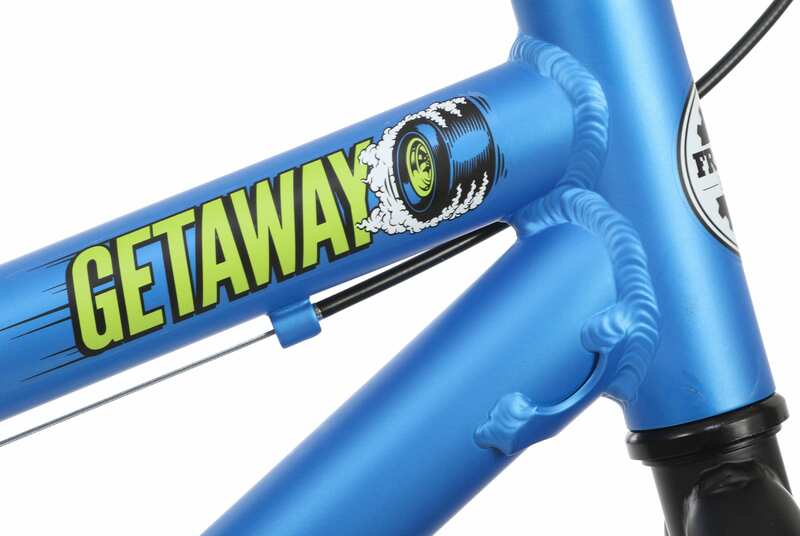 Set your worries aside with the Getaway BMX Bike from Framed. 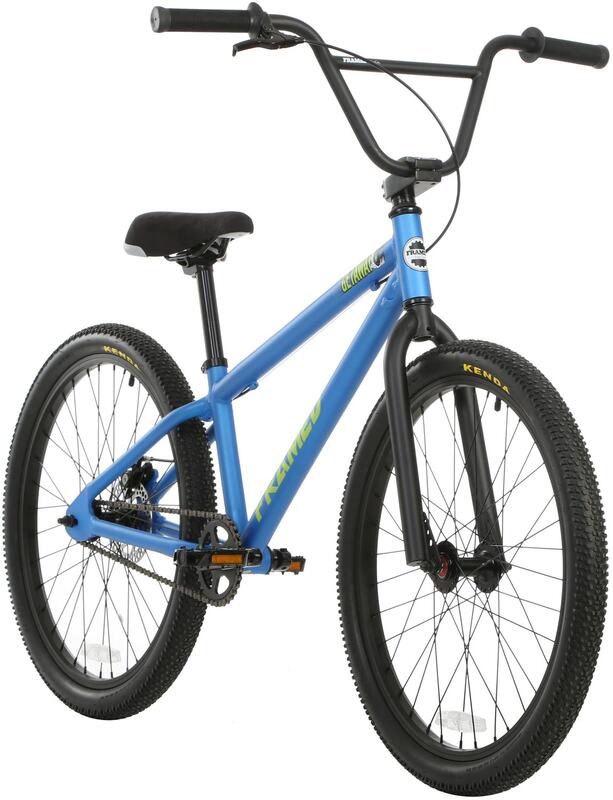 This BMX bike features a sturdy frame with freestyle geometry, making this bike perfect for the park. The frame is made from a durable alloy, ensuring strength while cutting down on weight. A variety of bike parts are made from Hi-Ten steel and chromoly so you can count on this bike lasting and performing well for years to come. This bike features standard unsealed bearings in the headset and bottom bracket so you have a smooth rotation at all times. A steel handlebar gives you lightweight and reliable control over steering, and include Velo Mushroom grips to ensure you never lose hold. 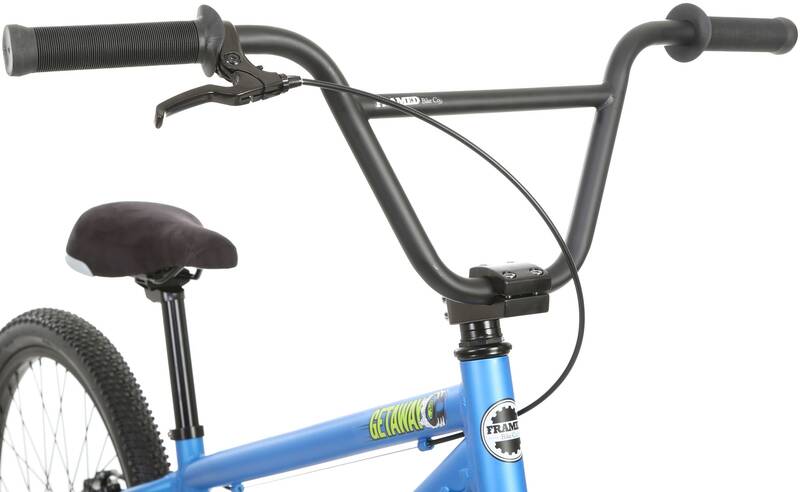 The next time you need to get away, take this freestyle BMX bike with you. Handlebar: 2 Piece Hi-Ten Steel 8" X 28.5"
Rims: Alloy Double Wall 24" X 1.75"
My 12 year old son loves it. Bike was shipped and received quickly. I'm 6'1 210lbs. 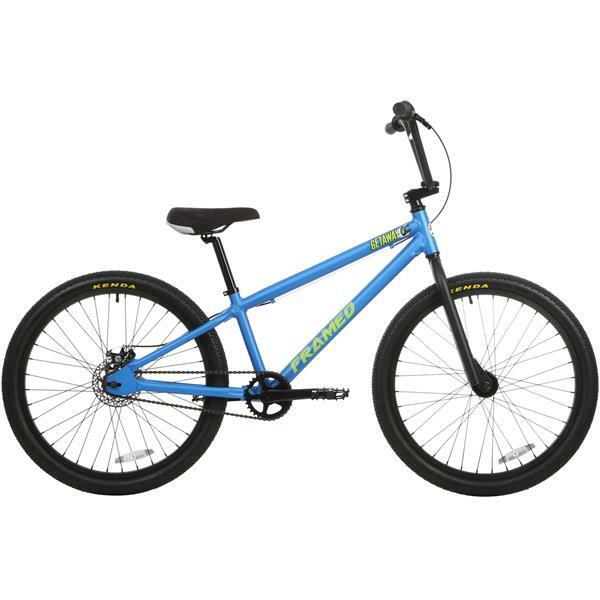 Looking for bmx bike to ride around with my son. And go on mild jumps. What's the better choice this or the twenty6er? BEST ANSWER: I'm 5'7 and I bought the 26er for myself. It fits me perfectly. The 24" was for my daughter who is about 5'1. You may want to look into the 29er at your height. I hope this helps. Good luck. 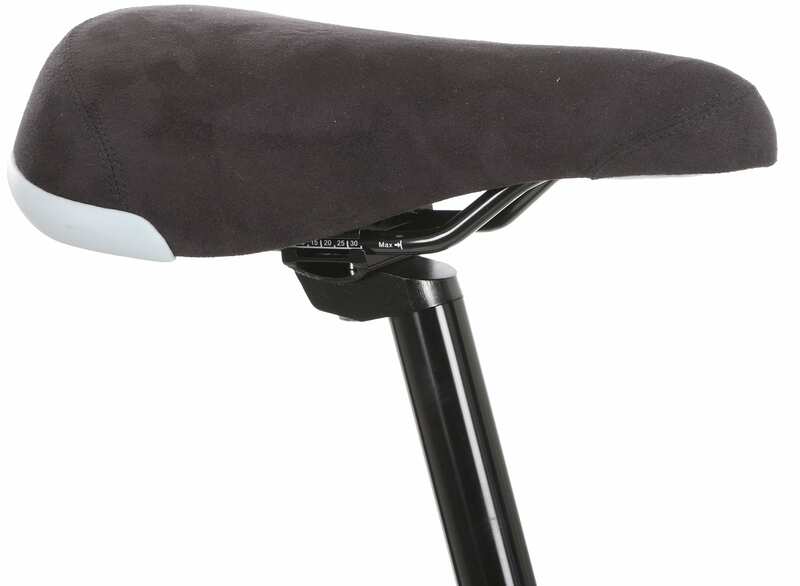 The 26er will be a better choice for you in this instance.... both from a fit and durability standpoint. What is the maximum weight capacity of this bike? I just checked with Framed bikes... it will be right at 200lbs. I just had our bike shop weigh one (they are new), and it is 26lbs 11oz. Can you mount a front brake to the bike? The posted answers are correct. There is really no way to mount a front brake to this bike. Simple and nimble is what Framed went with when creating the Getaway. There is no mount on the front forks if you change the forks you can but the bike is not made for tricks just racing. 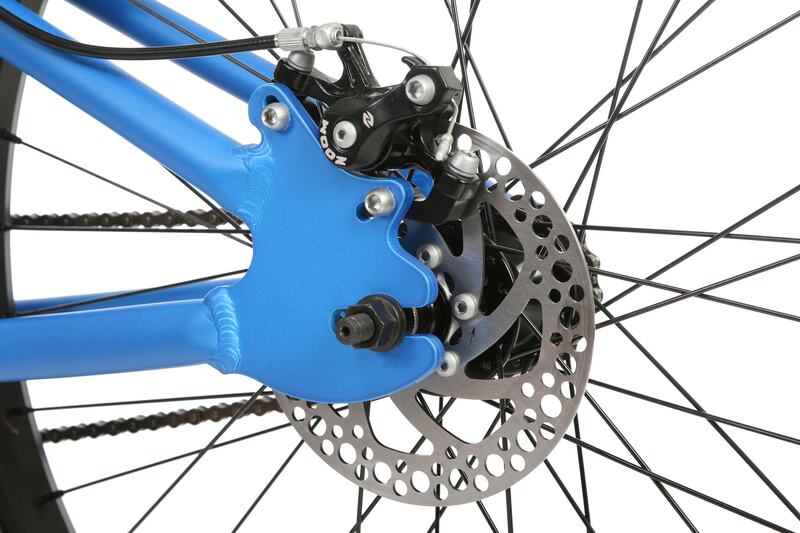 There are no provisions to do so such as brake bosses on the fork or mounts for a disc. BEST ANSWER: Qualify that question. It's not as fast as a cheetah or road bike, nor is it as slow as a tricycle. 24" wheels roll faster than 20" wheels, but not as fast as 26" wheels. Gearing changes are a sprocket away if you think this is too slow or too fast. My kid loves it. The bike's speed depends on how fast you can pedal. BEST ANSWER: I use it strictly for city riding because there really aren't many trails where I live. Think flat swanpy kinda place. I do use it on stairs and down hills in the park and it holds up to that. The few times I've hopped off ledges on the handle bars slipped no matter how secure I thought I had them. You may need to change the stem. 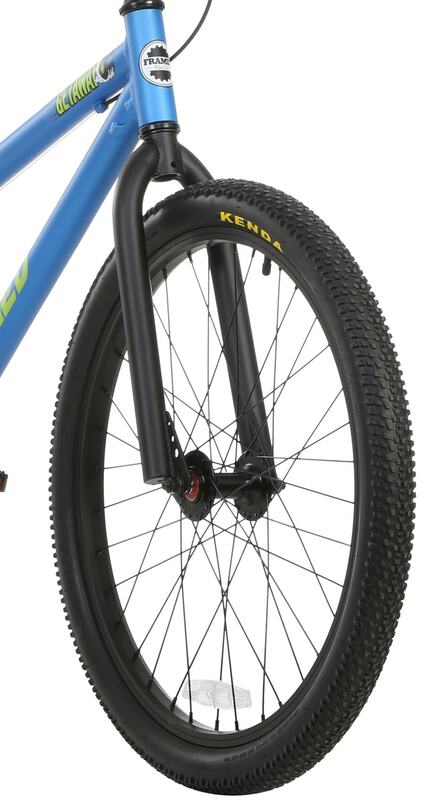 The tires are nice and thick with tred that looks suitable for dirt. The handle bars are pretty comfortable. The seat is unforgiving. The pedals are metal. The braking system is a disc brake on the back which could possibly break if treated too crazy. Anyway I'm ranting right now. I love the bike, it's my favorite bike I've ever owned. You may want to change some components before you do anything at a competitive level but for casual fun riding its great as is. Aaron is right.. this is a cruiser bike.. it will not be great for aggressive tricks or dirt jumping. It will be excellent for cruising the streets and and learning some basic tricks. what is the largest width tire this could take? BEST ANSWER: The largest we have tried is a 2.2" tire from shoulder to shoulder on the tread. 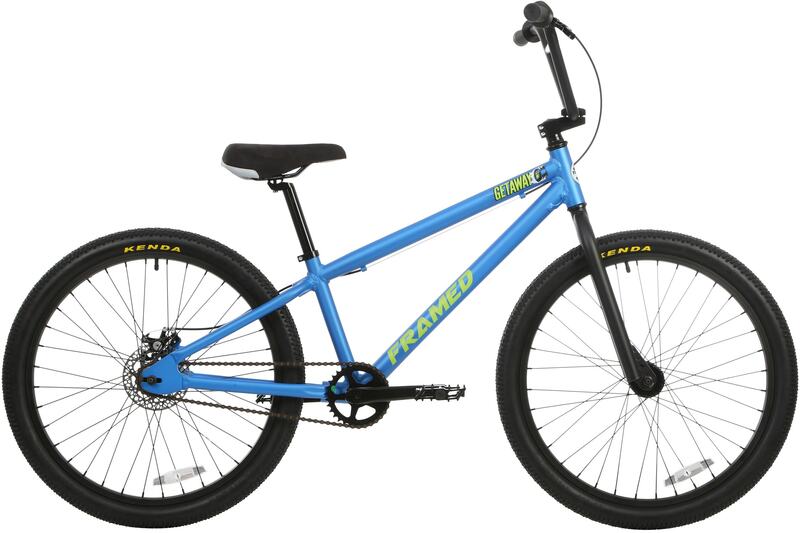 Do you know if framed is or will be making this bike in another color? If so do you have plans to have other colors instock? I am sorry for the delay... I needed to speak to the Framed peeps to answer this question. Framed is indeed continuing the Getaway, and more colors are in the pipeline.. we will get them. Look for it later this Spring. What is actual Top Tube length? 23.25 or 21.75 ? They list as both. 23.25 cm.. I will fix that. Thanks. Does this bike come with a warranty? I already bought it but there was no place for me to purchase a warranty, and it says not getting it put together by a certified tech could void the warranty. It does. 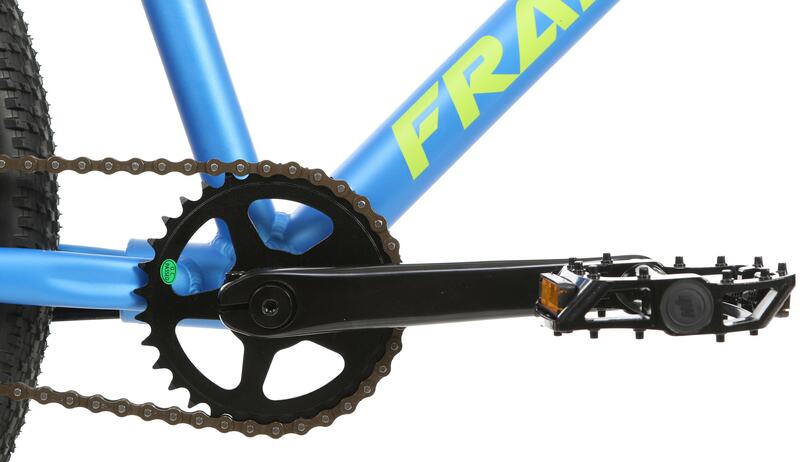 Framed says: "All Framed Bikes in this class with aluminum alloy, chromoly, or steel frames and forks are covered under a 1 year limited warranty. This warranty covers defects in material and workmanship. Paint and decals are not covered in this warranty. Painting over the bike frame and/or fork will immediately void the warranty. " What is the wheelbase on this bike? Sorry for the delay, I needed to check with our bike shop. "The Getaway has a wheelbase of 39 1/2 inches"